Today, I’ll take a brief detour from the current thread on thinking, knowledge and professional development to highlight a shining example of modern journalism from the NY Times. 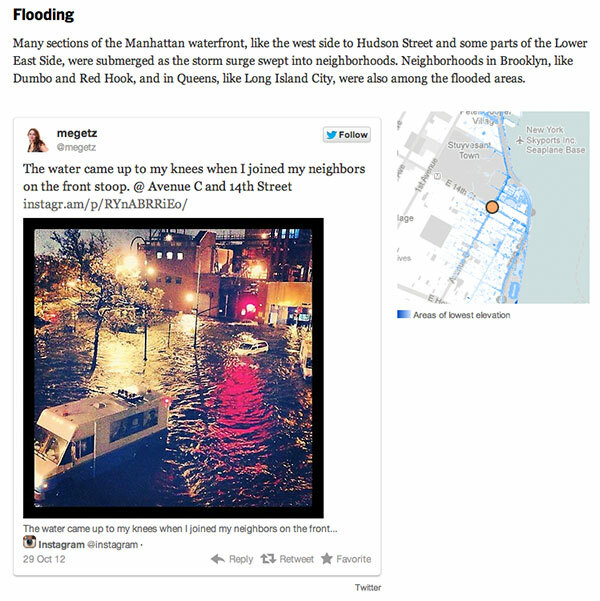 A good curation of materials illustrating damage by #HurricaneSandy by the @nytimes, nyti.ms/SulIZm. As Alasdair Allan points out, this well curated page uses a collection of professional and crowdsourced media to paint an informative and evocative picture of how hurricane Sandy affected New York City and the eastern seaboard. I believe this type of tightly-curated amateur and professional content woven together by the work of experienced journalists, is the future of journalism. Kudos to the staff at the NY Times for putting together such excellent reporting during such challenging conditions. Thanks for leading the way.